I have the LT55 and the LC55 for my camera. Is there any other accessories i could get for this camera? I am wondering if i can improve on the 18 zoom for example. Unfortunately it doesn't take a remote control so i use a 2 second delay when shooting so i can't do anything about that i think but was wondering if there is anything else i can get to enhance this camera? I can't think of much other than various filters. And a tripod. You can buy other macro lenses such as Raynox models for mor power on that end. Thansk Steve, I have a tripod but was wondering if i could get more lenses for better zoom really. Is the Raynox macro lens better than the lc55? Raynox makes a DCR-150 and a DCR-250. I have the 150. I think they are both more powerful than the Panasonic close-up lens. Mainly because they allow for closer focusing. The focus range is more exact, meaning you do not have as much leeway in the allowable distance, and because they are more powerful, it is harder to get a sharp shot doing handheld macro. So I don't know if I would say they are better, but different. What you can do though is clamp the Raynox lenses over another lens even if it is not threaded, and get a very powerful macro combo. I have another macro lens also. Purchased for around $20.00 from Amazon. Long title of Opteka 55mm 10x HD² Professional Macro Lens. Shot below was made using that lens. 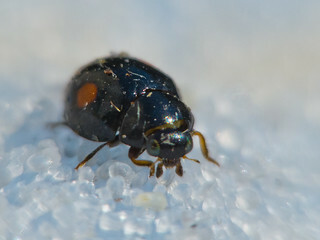 White dots are very small grains of sand, and the ladybug is pinhead sized. For the price this lens is a great deal. There are a couple more under this shot on Flickr that may be sharper. would you recommend me getting that lens? It's cheap enough. Can i add it onto my lc55 or is it seperate as in cannot use together? Would i need an adapter lens/ring? Found it on amazon but only recommended for a sony dslr camera? Last edited by eysha; May 17, 2012 at 9:15 AM. This lens has threads on both ends so you can use it with your lc55. The focus distance is very short. I would recommend this lens as it is cheap, and has its uses. Just make sure you get one with 55mm threading. Why do you have both the FZ38 and the FZ150? They seem to be very similar to each other apart from the zoom range. The 38 is a 46 mm so why buy a 55mm? There is a world of difference between the FZ35 (the one I have) and the FZ150 The FZ150 has a hot shoe, can shoot much better bursts, including RAW bursts until the buffer gets filled up, has the articulating screen, and lots of other upgrades. I bought it because the FZ35 was getting old and cranky, and I did not want to wait until it died to replace it. And it is good I did so, as I dropped the FZ35 last week and it is now dead. As far as your question about why buy a 55mm instead of a 46; you should not mount this or any other macro lens directly to the camera lens. The same adapter that is used for the Panasonic lenses is used for this one, and they have 55mm threads. THe only thing that should be mounted directly to the camera lens are light weight filters such as a UV or cross screen filter. The 150 sounds good. I really did fancy getting a DSLR but since they are so costly when you keep buying lenses etc that it becomes ridiculously costly. Would you say the 150 is just as good as a DSLR in many, but not all, ways? and it would have the advantage of being able to use the tcon lens and the macro lense i already have, is that right? tell me more about the 150. You need a different adaptor to mount your lenses on the FZ150. If you are happy with the picture quality of the FZ38 you will like the FZ150, but if not you won't. I think they are both very good cameras, the FZ150 has a different sensor that is a bit less noisy according to reviews, and it has more bells and whistles. I don't compare it with a DSLR though. I use Panasonics by choice as I walk a lot and carry the camera with me, and do not want to truck with a huge bag of lenses. I will say I post to bird forums, and with either camera I have had DSLR people ask me what lens I am using as they think I must have a fancy camera to get the shots I do.